KOCHI: When their son was born, Manjunath and Deepika’s joy knew no bounds. Manjunath who worked as a cab driver, in Hebbagodi, a small suburb of Bengaluru, offered sweets to all his customers that day. The happy parents decided to name their son Thanmay, meaning engrossed or absorbed, as he always seemed to be captivated by whatever he was doing! Everything was fine for the first few months. Then in June 2015, when Thanmay was around 10-months-old, Deepika noticed a swelling in Thanmay’s abdomen. He also started suffering from lack of appetite and vomiting. When the worried parents took him to the doctor, tests revealed the worst. The little baby was diagnosed with Hepatoblastoma, a rare form of liver cancer. He was evaluated thoroughly with blood tests, CT scans and biopsy. Chemotherapy was started and continued for six months. Despite Manjunath’s limited income, he was able to manage the expenses with support from friends. But chemotherapy had limited impact. While it stopped the cancer from growing further and prevented it spreading to other parts of the body, the tumour needed to be removed. But since it involved a large area of the liver, it could not be cut out safely. It was then decided to do liver transplantation as it was the only possible treatment for the liver cancer. His father volunteered to donate part of his liver and was found to be a suitable donor. Post the surgery, both Thanmay and his father were kept under observation and both made an excellent recovery. Grateful to the team of doctors for giving Thanmay a second chance at life, Manjunath and Deepika could not hold back their tears of joy when Thanmay was discharged from the hospital in the first week of May. Dr Mathew Jacob, Consultant Hepatobiliary and Transplant Surgeon, Aster Medcity at Kochi said, “It was a challenging procedure due to the large area the tumour took up in the liver. We are happy that the medical team has been able to successfully complete the transplant. Thanmay will remain under close follow up both to ensure that the “new liver” is working and fine. KOCHI: In a milestone achievement, 11-month-old girl Hazal Mariam has successfully undergone a liver transplant at Aster Medcity in Kochi. Hazal is the youngest person who underwent the surgery in the state . The infant had been suffering from a congenital condition, ‘Biliary Atresia’ in which bile flow from the liver to the gallbladder is blocked causing the bile to be trapped inside the liver resulting in damage and scarring of the liver cells (cirrhosis), and if left untreated, liver failure. A few months after Hazel was born, her mother Shini Koshy of Fort Kochi noticed a yellowish tinge in her skin, which increased over the weeks. The baby showed decrease in appetite and irritability. As her urine also turned dark, the worried parents consulted a local pediatrician. “On evaluation, it was found that the infant’s developmental milestones were delayed because of her condition. The first priority of the specialists was to get the infant fit for the liver transplantation. She was extremely malnourished and weak which could increase the risk of complications and survival after the transplant. The multi-specialty team that also consisted of pediatricians and dieticians charted out a detailed plan to nutritionally rehabilitate the infant prior to the transplant. “Since the infant was not feeding well, a feeding tube was placed via her nose to ensure adequate protein and calorie intake. We knew that we were racing against time as the liver disease was progressing rapidly,” Dr Rajappan Piillai, consultant, Neonatology said. The liver transplant operation was carried out successfully by a team of specialized transplant surgeons from Aster Integrated Liver Care. Hazel Mariam is now back at home and recuperating. Hazel is the first child of Shini Koshy and Jibin Koshy Vaidyan who is working in Abu Dhabi. The specialist medial team included Dr Mathew Jacob, consultant, Integrated Liver Care, Dr Naveen Ganjoo, consultant, Integrated Liver Care, Dr Rehan Saif, consultant, Integrated Liver Care, Dr Charles Panckel, consultant, Integrated Liver Care, Dr Rajappan Pillai P, consultant, Pediatric Intensive Care, Dr Suresh G Nair, senior consultant, Anaesthesiologist and Dr Sangeeth P S is senior specialist Anesthesiologist. Large pharma firms on an average spend about $10 billion on R&D to get a new drug to the market. Pandorum Technologies, a Bengaluru-based biotech startup, has developed an artificial tissue that performs the functions of the human liver. Pandorum said these 3D-printed living tissues made of human cells would enable affordable medical research with reduced dependence on animal and human trials. It will also eventually lead to full scale transplantable organs. Arun Chandru, 30-year-old co-founder of Pandorum said liver toxicity and drug metabolism are the key hurdles and contributors to failed human trials. Pandorum’s 3D bio-printed mini-livers that mimic the human liver will serve as test platforms for discovery and development of drugs and vaccines. The firm said these drugs would have better efficacy, less side-effects and be developed at lower costs. “We developed everything here in India,” said Mr. Chandru. “We can grow thousands of these tissues in the laboratory and test the efficacy of drugs on them for diseases including cancer.” He said large pharma companies on an average spend about $10 billion (Rs.66,290 crore) and ten years on research and development to get a single new drug to the market. Tuhin Bhowmick, 34, another co-founder of Pandorum said development of artificial organs has numerous clinical uses. The cell-based miniature organs can be used to develop bio-artificial liver support systems for preserving life in patients who have developed liver failure. “In the near future, such bio-printed organs will address the acute shortage of human organs available for surgical transplantation,” said Dr. Bhowmick, who holds a PhD from the Indian Institute of Science. Pandorum was founded by a group of friends in 2011 who were pursuing their higher studies at the IISc. They came together to work on the development of artificial human organs after winning a business competition. Surviving initially on money from friends and family, the team approached the Department of Biotechnology with their vision. The company was awarded funding support by the Biotechnology Industry Research Assistance Council in 2012. The same year, the company got incubated by the Centre for Cellular and Molecular Platforms in Bengaluru. Mr. Chandru said they created the innovation with a funding of about Rs one crore, more than half of which came from the government. Scientists and startups across the globe are growing artificial organs made of human cells to better study diseases and help test drugs. A team of researchers led by a Hebrew University professor Eduardo Mitrani is growing pancreas in a petri dish to better regulate blood sugar in diabetic patients. The global artificial organ and bionics market is expected to reach $38.75 billion (Rs.2.5 lakh crore) by 2020 at an estimated CAGR of 9.3 per cent from 2014 to 2020, according to a study by Grand View Research. Pandorum’s ultimate aim is to make personalized human organs such as lungs, liver, kidney and pancreas on demand, according to Mr. Chandru. Pandorum’s innovation takes the area of making artificial organs to the next level. Bengaluru-based bioinformatics firm Strand Life Sciences founded by IISc professors had earlier developed a virtual liver that mimics the functions of liver through software simulation. It is a predictive method that integrates data and insights for deeper understanding of the impact of a drug on the liver. The platform can predict the toxicity of several known drugs and toxins and explain the mechanism. Fatty liver disease is the accumulation of excess fat in the liver. It is well known that excessive alcohol consumption leads to an enlarged liver and this can lead to serious liver damage if an individual continues to drink alcohol in excess. But in the last 30 years, doctors have noted that there are a large number of patients who drink very little or no alcohol, but continue to have excess fat in the liver. This condition is known as non-alcoholic fatty liver disease (NAFLD). It has also been found that this form of fatty liver disease can cause further swelling (inflammation), liver scarring (cirrhosis), liver cancer and liver failure. Fatty liver is an extremely common disease and it is estimated that it affects up to 5 -20 per cent of Indians. NAFLD can affect men, women, and children of all ages. It is most common in people who are overweight. The risk is further increased if an individual has diabetes, high cholesterol or high blood pressure. Consumption of a diet rich in fat, calories and fructose is also associated with a fatty liver. With one in six persons overweight, 15 per cent of Indian children overweight, there is also an increase in the occurrence of diabetes. It is estimated that the simple fatty liver may affect 5-20 per cent of Indians. But the good news is that most individuals almost never progress to severe liver damage. However, if the person develops liver cirrhosis, there is a high risk of liver failure, liver cancer and death. Symptoms: Most people with fatty liver will not show any obvious signs. Some may experience a dull pain on the right side of the belly due to enlargement of the liver. Other symptoms are general fatigue, nausea and loss of appetite. Once cirrhosis develops and liver failure sets in, there may be a yellowness of the eyes, accumulation of fluid in the body (edema), vomiting of blood and jaundice. Diagnosis: Fatty liver is usually noticed during routine checkups when a doctor spots an enlarged liver through a scan. Blood tests of the liver may be abnormal or an ultrasound scan may show fat in the liver. It is also popularly called the “silent disease”. There are no symptoms until the condition progresses to liver cirrhosis or failure. So never miss your routine check ups if you are a regular consumer of alcohol, are overweight, have diabetes and high level of cholesterol. Treatment: There is no medication to treat a fatty liver. Early fatty liver is usually easily reversed through dietary changes, weight loss, exercise and control of risk factors such as diabetes. Obese patients may benefit from weight loss (bariatric) surgery. Lose weight if you are overweight, but avoid rapid weight loss. Exercise at least 30 minutes per day. Reduce the amount of fat in your diet. Avoid a carbohydrate-rich diet (potatoes, white bread, white rice). These get absorbed quickly by the intestines and get converted to fat in the liver. Food items that get absorbed slowly (such as unprocessed fruit, nuts, pulses and grains, apples and oranges) are beneficial. Be cautious of eating too many fruits, juices and carbonated drinks rich in fructose. Antioxidants such as Silymarin, Vitamins C and E may have some benefit. Never miss your annual health checkups. If you have diabetes and hypertension, treat it effectively. Even if you are a light alcohol drinker, it is ideal to stop alcohol consumption completely. The author is a consultant in Liver Diseases and Transplantation at BGS Global Hospitals, Bangalore. 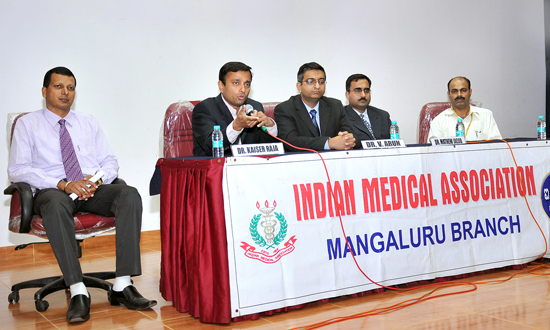 Mangalore, May 23, 2013: The city branch of Indian Medical Association (IMA) and Institute for Liver, Pancreatic Diseases & Transplantation, BGS Global Hospital, Bangalore jointly conducted a Continuing Medical Education (CME) programme on ‘Liver Transplantation’ recently at Dr A V Rao Conference Hall, IMA House, Attavar, Mangalore. A team of liver transplantation experts from BGS Global Hospital led by Dr Kaiser Raja, head of the department of Hepatology and Gastroenterology and comprising Dr Mathew Jacob, senior consultant, Hepatobiliary and Transplantation Surgery and Dr V. Arun, senior consultant, Pain Medicine were the speakers for the Scientific Programme. After the rendering of the IMA prayer, the IMA president Dr M Manjunath Shenoy welcomed the gathering. Dr Nithish M Bhandary, IMA secretary gave a report of the month’s activities. The scientific programme consisted of three guest lectures followed by question/answer forum. The second speaker Dr V Arun spoke on ‘Anesthetic Challenges in Liver Transplantation’. “Liver disease is the ninth most common reason for death in India,” he said, “The liver is a unique organ of the body as it is the only body part which can regenerate even if 70% of its volume is removed and just 30% is left.” He introduced the concept of Integrated Liver Care, whereby a specialized multidisciplinary team of doctors and professionals drawn from various streams provide the comprehensive treatment under one roof. Touching upon critical care requirements, he also explained the concept of specialized Liver ICU. “Mortality was 20% in the 70’s, now it is less than 3%”, he said. He explained that liver transplant can be performed from two sources: from cadaveric donors and live donors. In cadaveric donors, the liver is harvested once it is ascertained that the person is brain dead and the legal, medical and ethical formalities are completed. “Cadaveric donors are the ideal donors for liver transplant. In the West, almost 90-95% of the transplants are from this source. In India, due to the scarcity of cadaveric donors, we are dependent on live donors to the extent of 80%. This situation should change gradually as there are many agencies and NGOs promoting liver donation in a big way,” he said. Later answering various questions from the doctors, the panel of speakers explained that Liver Transplantation calls for integrated care and at present there are only 6 or 7 centres in India which do over 50 liver transplants per year. They urged that organ donation should be encouraged and promoted so that more transplants can be performed from cadaveric donors. This can be achieved with greater awareness. It is important that those who want to sign up as cadaveric donors should discuss the matter with their families as they will be the ones who have to take the call, they said. BANGALORE: This mother gave not just one life to her child, but two. Ten-year-old Harshita, a Class IV student was diagnosed with jaundice in March this year, following which her liver developed severe complications and was damaged. It required another liver to revive her. Her 35-year-old mother Manjula did not think twice before donating a part of her liver to her daughter. “The incidence of Wilson’s Disease is about 30 per million globally. The liver becomes cirrhotic due to copper deposition, and then, it fails. Harshitha was very sick and required an immediate liver transplant. Cadaver donors are difficult to come by and time was running out for the little girl,” said Dr Sonal Asthana, Chief Liver Transplant surgeon at BGS Global Hospital, Bangalore. “As cadaver donation (organ donated by a brain dead person) would have taken some time, our first option was to get a donation from a family member. We spoke to the parents and explained the procedure to them. We also told them that if a part of the liver is removed, it grows back fully within six months. Harshitha’s mother immediately agreed to donate her liver,” said Dr Asthana. Manjula underwent a blood test; her blood group matched with Harshitha. Various tests followed and she was found to be a suitable donor. The government committee met in an emergency session to consider and cleared the girl’s case, as this was the only way she could be saved. “The procedure of a liver transplant is safe but lengthy. The girl suffered acute failure, so we had to do something in 48 hours. We removed 40% of the mother’s liver and transplanted it in Harshita. The mother and daughter are doing fine. About 90% of Manjula’s removed liver would grow back in the next 4 weeks and rest in 6 months,” explained Dr Asthana. Manjula and Anand R, a travel agent, have got two daughters. Their younger daughter Yashshwini is 7 years old.